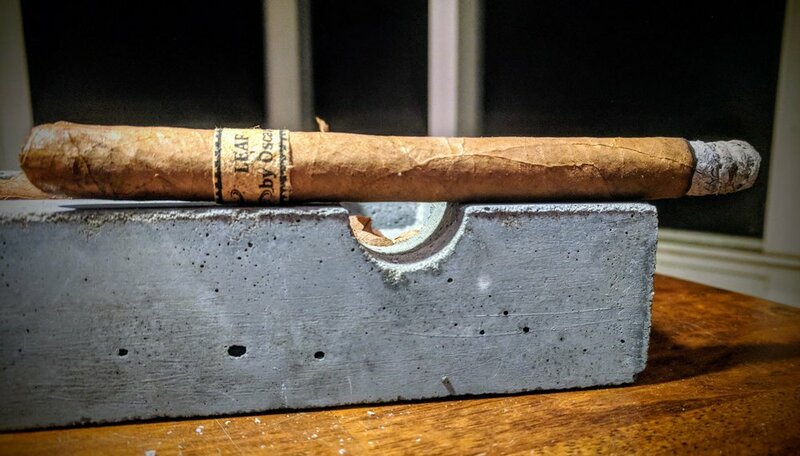 In my review of the Connecticut, I raved about the loose tobacco leaf protecting the cigar and the great traits it brought to the brand. Unwrapping this Sumatra lancero, I found a complaint. The protective leaf wrapping the cigar matched the cigar's wrapper leaf, that I mistakenly tore bits of the cap off trying to unwrap it. Nothing major, but lesson learned - unwrap these like a Tootsie Roll for best results. The Ecuadorian Sumatra wrapper adorning this Leaf offering has a definite rustic quality to it. It's not nearly as 'pretty' as the gorgeous Connecticut wrapper from my previous review. The color is somewhere between a light tan and faint green - resembling a double claro or claro. This coloration is a little bit of a surprise since I feel like many Ecuadorian Sumatra wrappers are on the darker end of the spectrum. The cigar has a decent oily sheen to it which makes the prominent veiny characteristics of the wrapper leaf really stand out. A quick squeeze and the cigar feels solidly made with no soft or hard spots - just a consistent firmness. As noted above, I twisted off any pigtail detail the cap may have had while freeing the cigar from the loose leaf. It's harder to be critical of the Sumatra for that reason but I will say that the cap is a little sloppy and the seam transitioning from cap to body is easy to spot. The shoulder is nice though - dropping well into the cigar. The foot is a little beat up. It looks like a deflated basketball. The blend within looks well-packed however and I suppose that's what really counts. The Sumatra wrapper's aroma is ripe with some of its trademark characteristics - cinnamon, cedar and maybe a bit of cocoa. The cold draw is open without being too free-flowing. Flavors are really fantastic - some creamy citrus and cinnamon. To switch things up, I v-cut this lancero. A quick toast of the foot and this stogies lit. Leaf's Sumatra lancero lights up quite easily and immediately produces a gorgeous white ash with plenty of lightly scented smoke. The draw is excellent however the flavors are a bit lacking. The immediate flavors on the tongue are very light chocolate and cream - nothing heavy at all. The retrohale is fascinating - bringing out some awesome vegetal flavors and ... bear with me ... a really good rich creamy mushroom flavor. The Sumatra is plentiful with smoke when puffing and then immediately mutes to nearly no smoke. The smoke is billowy and white and a very light aroma to it. I can easily see this cigar being non-offensive to non-smokers. A couple inches in and there's no denying this is a very mild, mellow smoke - almost like what I expected from the Connecticut blend. There is certainly some faint citrus and cinnamon lingering along with velvety, creamy vegetable/mushroom. It sounds like a strange combo but it really is like a well-balanced dish - everything is popping at the right moment and dancing quite elegantly across the tongue. This cigar leaves a distinct smooth, creamy mouthfeel to be sure. As indicated on the light up, the draw is open and great - each puff moving a plethora of smoke to the mouth. Much like the CT lancero, the burn is impressively perfect - although leaning just slightly. The ash on this cigar is beautiful. A faint greyish-white that steadily held until I clumsilly knocked it off after about an inch. Almost immediately the middle third introduces a healthy amount of pepper. To me, it's a milder pepper so I'd say white pepper rather than black (or any other color you'll see people try to claim). The rich, earthy mushroom flavor is still hanging around but the profile is really starting to shift in a pleasant direction. To compliment the pepper, there's now some wood and coffee. Everything again is paired up nicely and very well balanced. The middle third of this cigar might be the best I've smoked in a very long time - truly excellent flavors and combinations happening. I've got to say - this cigar will not win any beauty pageants. This Sumatra wrapper just gets uglier the longer I look at it - luckily there's less to observe the longer I smoke. It cracks me up to read other reviews fawn over the wrapper's aesthetic but maybe it's like how some people like shiny Harleys and others prefer those rusted out steampunk looking bikes. Either way, the mechanics of this cigar are performing perfectly - great draw, good, self-correcting burn line and some great smoke/ash. Well, as can be expected the masterpiece that the middle third presented could not be maintained through the final portion. The flavors have shifted to ho-hum with a moderate dose of white and black pepper and some toasted crackers. Along for the ride as well are some generic light earth tones but nothing too remarkable to speak of. I'm still unable to find fault with the draw or burn - both continue to be excellent. 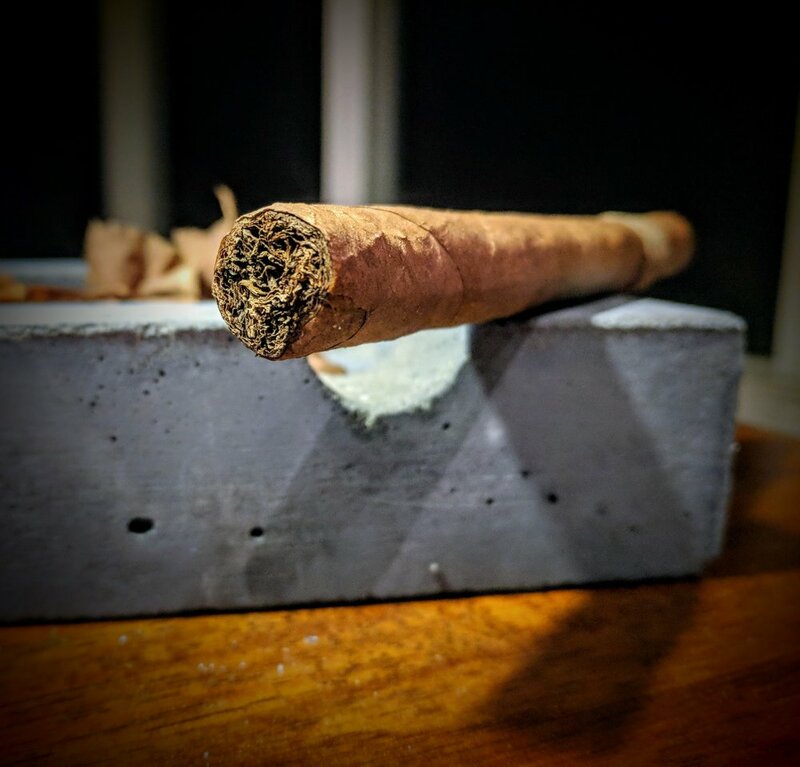 Leaf by Oscar's Sumatra blend in the lancero was wonderfully flavorful starting with a great velvety citrus tones and evolving into a hearty, peppery vegetable soup-like finale. The final third's profile was a bit lacking but the middle third more than made up for it. The middle third is probably the best I've had recently - perfectly balanced and sublime. 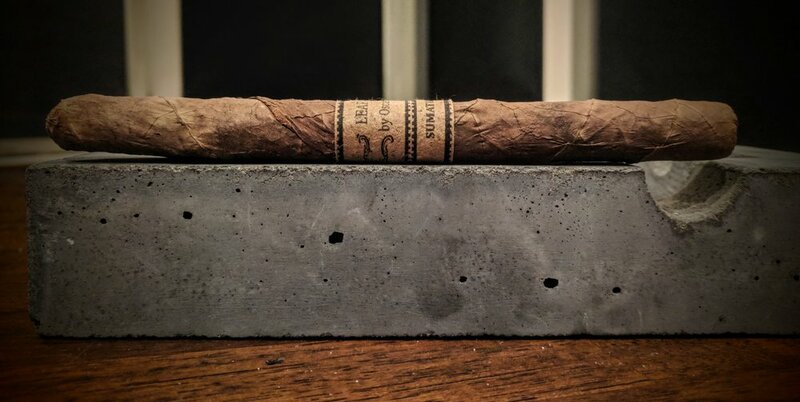 Like the Connecticut I reviewed before this, the Sumatra lancero burned excellently. There were almost no concerns with the burn, draw or experience as a whole. The Jim and Oscar tag-team worked wonders again on this blend. 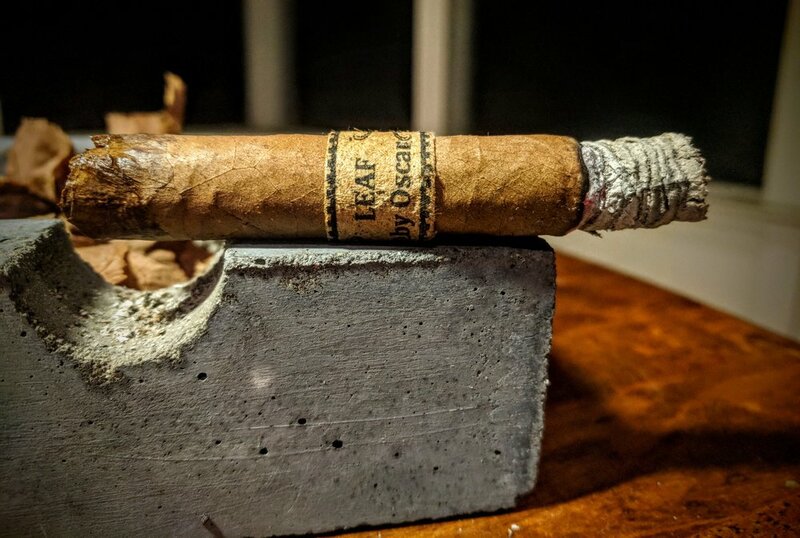 The Leaf by Oscar Sumatra is a FANTASTICALLY constructed cigar that you can light and forget about. It's not the best looking cigar but it's what's below the surface shines. The blend itself has some high and low points - the first third is a great start to the smoke with a great follow-up in the second third. The final third couldn't quite close the deal, but overall this was an excellent cigar full of some unique, carefully balanced flavors. The strength and body is approachable to just about anyone. Do yourself a favor and grab a few of these to stash away. I struggled to find any reviews for a Sumatra lancero but there seemed to be plenty for the toro vitola. 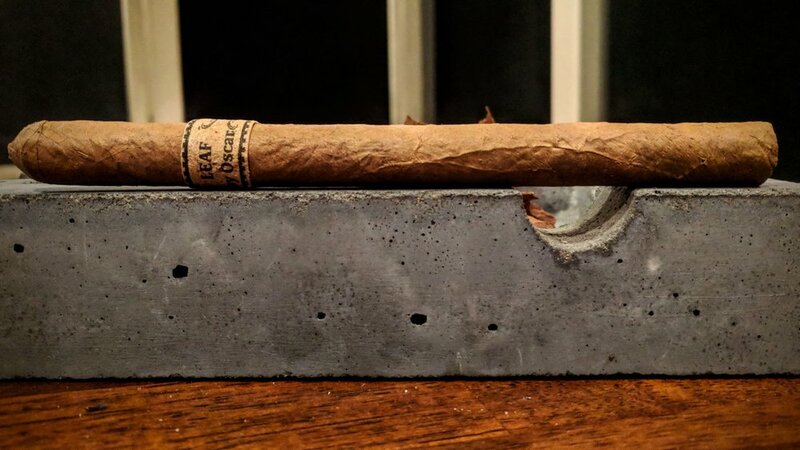 Based on the toro reviews, it seems I could have been a little over critical of the lancero but it's hard to compare the two sizes/blends directly. Smoked a Leaf by Oscar Sumatra lancero? Let me know what you thought below!